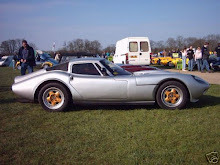 The Marcos Mantula, now a very rare car and of approx 170 ever made very few were actually built as "factory built" cars, the majority being sold in component form and it is unknown how many actually still survive today, there are owners however spread all over the world with a healthy "owners club" who meet up a couple of times a year and a on line forum with a wealth of information available. 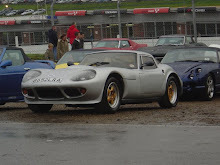 I will be doing research with my car's previous owners and also Marcos Heritage who have the original build files available for each car (update they haven't got one for this car !!) and hope to be able to get as many pictures, stories, history about the car in due course. The unconfirmed info i have been given is that the car was originally built in 1986 for the Alexander Palace Motorsport show as a track car and was owned by John Eales (well known in the Rover world for his engine work) who used it for sprinting, the log book still refers to its TVR 5.0 engine and it will be interesting to know what success it had and how many bumps it suffered during it's time on the track. 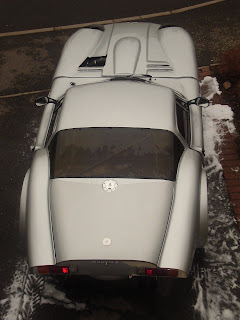 Interestingly as it was built as a track car it is a lightened version and the body is constructed from a lightweight woven glass mat as opposed to the normal fibreglass. At 43" tall in their standard form and weighing approx 900kgs these cars with their various Rover V8 power options and light body are usually very quick cars with times quoted of approx 5.7 secs to 60mph and double the UK speed limit however with this special lightweight version and blueprinted engine i am certainly looking forward to driving this car. 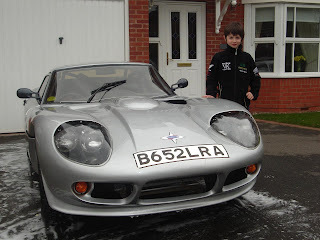 In 1996 it was sold by John Eales minus engine and converted to a road car and registered with the DVLA. 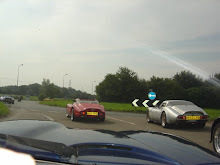 As it was originally factory built it was allowed a age related registration plate with a "B" suffix as opposed to a "Q" plate which many home built cars display, this again makes the car more special. The present power plant consists of a blueprinted Rover V8 3.500cc with twin SU's, no fuel injection issues to worry about then, a crane camshaft, anti pump lifters, HD springs, power pulley, comp gaskets, a 5 speed gearbox. The car retains it's full roll cage (with a car so wide and only 43" tall it's got to be near impossible to roll) and has a fully Rose Jointed Tubular Suspension, adjustable rear anti-roll bar, Koni 8212 Shocks, 4-pot Girling Calipers and vented disks front, oversize drums rear and dual master cylinders with a balance bar, a Limited Slip Diff, live axle with rose jointed trailing arms and panhard rod. 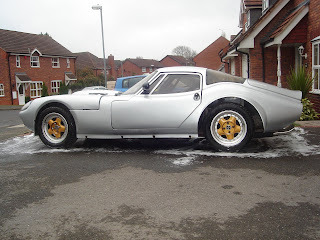 Inside the car is a Sparco four point harness and the car is finished with attractive purpose looking Compomotive split rims on Bridgestone tyres. A new dual exhaust system was fitted new in 2005 with a balance pipe (kinda loud apparently !!) and a new Custom Alloy Fuel Tank. Now for the bad bits, the car was taken off the road by previous owner Nicholas as it needs 2 outer chassis rails replacing and access to these are only gained by removing the body from the chassis. The body is presently sitting back on but once i have some garage room sorted to store the body i will remove it again and repair as necessary, it may be that other chassis work is required but until the body is removed this is a bit of a unknown. 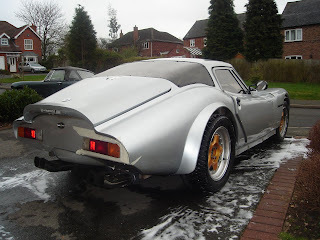 An option for long term Marcos owners is to get the chassis galvanised but sounds expensive and is best left to the experts. The interior is very tired and whilst functional in a yuk dark blue this will need re doing with a full leather interior (of course) along with a new dash and headlining, options could be to keep to the race theme as the car was built or go for a more lux version, it will be some time before i have to worry about that option !!. The bodyshell needs some minor repair work all over to correct some minor defects and is generally looking tired, once repaired a full paint job will be needed, no idea about colour yet, suggestions on a postcard please ! Unique to Marcos cars and worth mentioning is the pedal assembly, as there are no actual seats in a Marcos, the leather seat cushions surround the driver and passenger and simply rest against the shape of the body inside the car which works well holding the driver well supported especially with the huge transmission tunnel and to adjust for different drivers foot reach the whole pedal assembly moves forward or backwards as one by turning a small dial inside the car. So basically it's a all out racer with no coffee cup holders in this car, no heater, no air-con and no radio, with its 4 exhaust system you probably would not hear it anyway. I've got a lot of work ahead of me but getting this one off special car at the price i paid was reflected in the work that needs doing, i am somewhat excited and are looking to getting the body off to take the first step in making this a great car again. it must be nice to have money!! Gordon will be pleased with the extra tax when you fill her! looks a crcker.try to rebuild while you are young enough to enjoy.